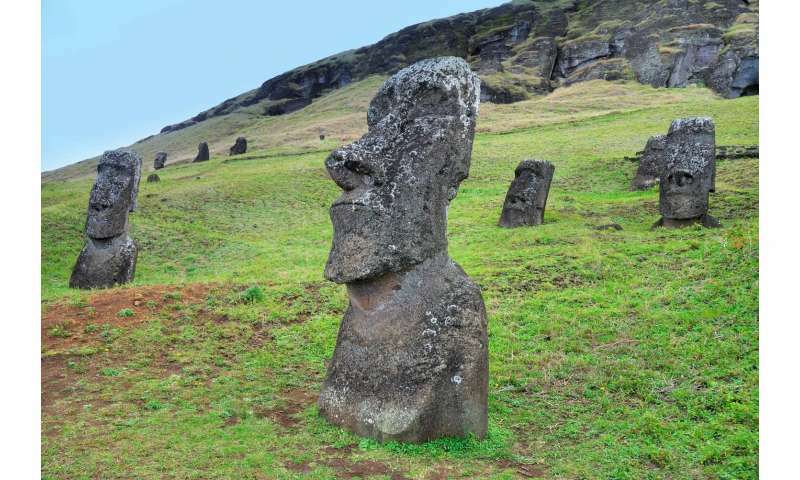 "Despite its almost complete isolation, the inhabitants of Easter Island created a complicated social structure and these amazing works of art before a dramatic change occurred," says Dr. Cedric Puleston, lead author of this study, based at the Department of Anthropology, University of California, Davis, USA. "We've tried to solve one piece of the puzzle - to figure out the maximum population size before it fell. It appears the island could have supported 17,500 people at its peak, which represents the upper end of the range of previous estimates." He adds, "If the population fell from 17,500 to the small number that missionaries counted many years after European contact, it presents a very different picture from the maximum population of 3,000 or less that some have suggested." Previous archaeological evidence implies the indigenous people numbered far greater than the 1,500-3,000 individuals encountered in the 18th century. The population history of the island remains highly controversial. In addition to internal conflict, the population crash has been attributed to "ecocide," in which the Island's resources were exhausted by its inhabitants, reducing its ability to support human life. "The project, funded by the U.S. National Science Foundation, involved a number of really good researchers, including archaeologists, a local expert in Rapa Nui culture, a soil scientist, a biogeochemist, and a population biologist, to get a thorough picture of what the island was like before European contact," he explains. "We examined detailed maps, took soil samples around the Island, placed weather stations, used population models and estimated sweet potato production. When we had doubts about one of these factors we looked at the range of its potential values to work out different scenarios." "The result is a wide range of possible maximum population sizes, but to get the smallest values you have to assume the worst of everything," says Puleston. "If we compare our agriculture estimates with other Polynesian Islands, a population of 17,500 people on this size of island is entirely reasonable." He concludes, "Easter Island is fascinating because it represents an extreme example of a natural experiment in human adaptation, which began when people from a single cultural group spread quickly across the islands of the Pacific. The different environments they encountered on these islands generated a tremendous amount of variation in human behavior. As an extremely unusual case, in both its cultural achievements and its ecological transformation, Easter Island is remarkable and important. It retains an air of mystery, but it's a real place and has a real history lived by real people. Dispelling that mystery brings us closer to understanding the nature of humanity." ...perhaps they were one and the same culture. Recent excavations leave the suggestion that Easter Island was in some manner buried. The situation is reminiscent of the huge "sand scars" which suddenly buried civilizations across northern Africa and the Middle East. Excavations in the Middle East, in particular, have probably only scratched the surface of all of these buried cultures. Perhaps the theorists should consider the possibility that the former ecosystem did not actually resemble the one post-inundation. And maybe they should start a far larger digging effort? AN excellent example of overreach and megalomania. @Chris_Reeve Do you believe everthing that is unsubstantiated? What's your opinion on that invisible so-called "air" that you're "breathing" now? No it's not complicated, it's silly. Unexpected varnish? The iron oxides and the clay that binds them to the sand are both the breakdown products of certain igneous rocks (basalt, for example) when exposed to oxygen and water. All it takes is ash from a volcano and a little rain or dew. If you use google maps to look at satellite images of the Sahara, you can actually follow red-streaked sand upwind to either volcanoes or patches of dark, intrusive igneous rock. But the real clincher is the fact that Mars - Chris's putative source of sand - has different isotope ratios for many elements, including oxygen. If sand was from Mars, someone would have noticed the distinctive isotope ratios and would have become famous... many decades ago. Uh-huh. Instead of responding to the isotope ratio issue, create a crap-flood of other dubious claims and hope no one notices you're dodging the fatal flaw in your argument. The isotope issue is one of your "worldview". The isotopes could be altered under high energy discharges that displaced the material. An old story... tropical animals on an island, pop growth exceeds resource supply, tribes congeal, warfare ensues, ecosystem collapses, everybody dies. If they had been closer to south america they couldve begun exporting soldiers and colonists like britain and built an empire. The question is, why isnt australia full of japanese? Sometimes it works sometimes it doesnt. There it is again, the magical electrical wand! It can do anything, as long as no one asks for a specific mechanism that describes how it works. Alas, transmutation of matter is beyond barakn. Note, discharge plasmas such as those found in tomakaks can transmutate matter. What is remarkable from the photography is that the coating is evenly applied. This is surely why mainstream theorists have repeatedly declined to propose a physical mechanism for such a coating. Water would naturally form a uniform film based simply on surface tension. As far as I can tellthe comments (MEGO) above are ignoring the the posted article. Which offers some possibly accurate answers to the researcher's speculations. To address the commentators whinging about possible sources of sand... Sand? Evidently several of the commentators do not grasp that over millions and billions of years. There have been results of cyclic eras of tectonic uplift and downpull and driftaway. Far away! With consistent erosion by wind and water and glaciation. Furthermore, ignoring the effect of a hundred thousand years of fires set deliberately and accidentally and drunkenly. Every generation after generation by our ancestors. Then, within the last ten thousand years chopping every tree in sight for firewood and construction. In addition to the damage from overgrazing with endless herds of domesticated animals.